A man of the match performance from Charlie Phillips and a home debut goal from brother Billy saw the Dynamos turn in a brave display against the EPL’s Milton Keynes Lightning before going down 7-2 in the English Challenge Cup. The opening period saw a frantic start and it was the Lightning who came closest early on – Lewis Hook steering onto the far post from close left with a well-placed shot beyond the reach of Chris Douglas. At 03.42 the visitors then took the lead – a swift counter saw Milan Koustourek escape down the middle on a 2-on-1 and the Czech forward used his teammate as a decoy before rifling high inside the top far corner for 1-0. Soon after the restart Charlie Phillips then introduced himself to his new home crowd with a crushing hit on Leigh Jamieson – the first of many with far more following before the night was out. Nevertheless it was the Lightning who looked most dangerous on the ice as Chris Douglas first scrambled across the crease to deny Josh Nicklin’s back post effort before a similar move was needed to block an Adam Carr follow up. The Dynamos were resilient though and almost levelled when Nicky Lewis left his marker behind him to go in close left but his near post poke was thwarted by the leg of Jordan Hedley. Hedley would be beaten at 17.35 however – the netminder using his pads to stop Juraj Huska’s slapshot from out wide but not moving quick enough with his glove to stop Steve Osman racing in and bundling home a loose puck from point blank range for 1-1. In the second period the Lightning returned to the ice early and their eagerness was translated into a bright start with Chris Douglas required to deny Tom Carlon’s 5-hole bound slapshot. He could do nothing at 24.49 though – Lewis Hook sending Adam Carr in alone close right and the Milton Keynes captain dispatching just inside the upright for 2-1. The Dynamos bench were screaming offside but the officials remained unmoved and the Lightning now had a dubious advantage. That edge then grew at 30.05 – Billy Phillips sitting a roughing minor as Petr Horava’s slapshot from the blue line straight after an offensive faceoff flew through traffic and sneaked beyond Chris Douglas to make it 3-1. Jordan Cownie could have added to that lead as he attempted to fool Douglas with quick stick work right in front soon after but he was denied allowing the Mos to cut the deficit to one when they hit back late on. With the clock showing 36.22 an Elliott Dewey drive to the crease pinballed around before deflecting out to the on-rushing Billy Phillips in the left circle – the defenceman roofing over Jordan Hedley with a backhand sweep for 3-2. It was a reply the Lightning would cancel out swiftly – Grant McPherson finding Jordan Cownie and the forward driving at net with Chris Douglas able to take most of the pace off the shot but not enough to prevent it edging over the line for 4-2 at 37.48. In the final period Milton Keynes again started brightly and they added to their lead at 41.35 – Milan Koustourek doubling his tally for the night as he escaped on the breakaway, shifted onto his backhand to commit the goalie and lifted into the now unguarded net. 5-2 then became 6-2 despite a hooking minor to Lewis Christie – Chris Douglas leaving his crease to play the puck behind his frame but momentarily losing it against the boards allowing Leigh Jamieson to nip in, steal possession and turn into an empty target for the shorthanded strike. By now the extra firepower at the disposal of the Lightning was starting to show and they might have added another had Lewis Hook not skated straight into the uncompromising frame of Billy Phillips right in front to send himself sprawling. Their seventh did follow at 51.49 however – another shorthanded effort, this time with Michael Farn in the box for slashing, as Arran Strawson lost his footing out wide allowing Adam Carr the clear centring pass for Petr Horava to poke home from the edge of the crease. Despite a sizeable deficit the Mos continued to battle on and Jordan Hedley had to react quickly to deny two Andy Smith attempts in quick succession before a gilt edged opportunity fell the way of Harrison Lillis right in front only for him too to be turned away. 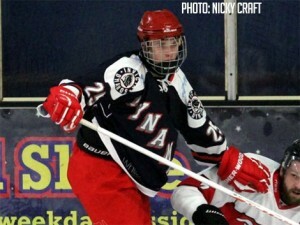 In the closing moments Charlie Phillips then entertained the crowd with two of the biggest hits seen at the Silver Blades in recent seasons – the first a thumping check into the boards on Josh Nicklin and the second a phenomenal clean mid-ice crunch that sent Milan Kostourek fleeing to the bench. So it was an English Challenge Cup loss for the Dynamos but they put in a more than respectable display and their visitors were pushed to their limit to secure the win. Milton Keynes had the extra touch of class you would expect from a roster in the league above but the Mos worked them hard and for the full 60 minutes to make them earn their two cup points. Man of the match awards went to the impressive Jordan Hedley of the Lighting whilst a fantastic home debut and some of the best checking in recent memory saw Charlie Phillips take the honours for the hosts.